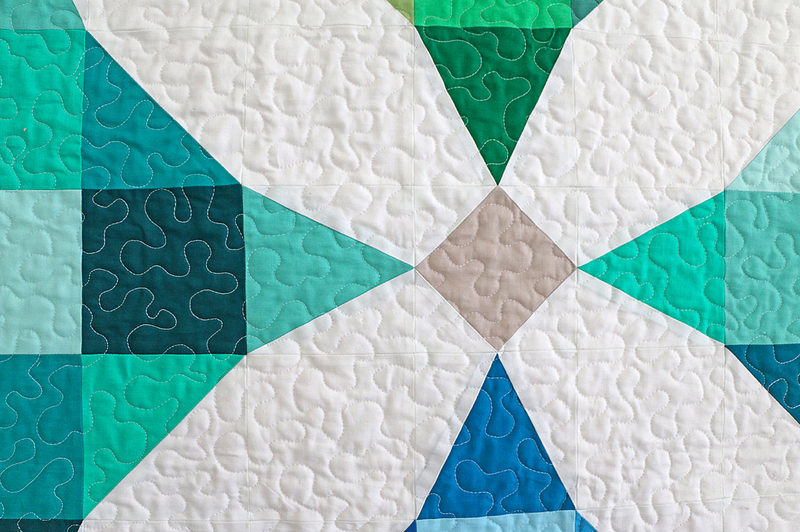 I have always enjoyed Lee Heinrich’s blog Freshly Pieced, and participating in WIP Wednesdays. I finally had a chance to catch up with her and am really excited to share our interview with you, and a give-a-way too. We are celebrating my belated 2nd Blogaversary, which was on June 6th. We both tried to have this posted on June 6th. And in all fairness, we both were busy with family matters. Lee was busy with her family visiting from out of town, and her kids were finishing up with school. My husband and I were awaiting our third grandchild, who was 8 days late, and finally arrived on Monday, June 9th. Then we ran up to Boston for 24 hours to meet Nolan, our new grandson. I will save that story for another post, because this is post is about Lee. We both know how busy quilt bloggers and quilters are, and the point is that no one is immune to changes in schedules. We just do our best to handle them gracefully. So it is an honor for me to interview Lee. Her blog was one of the first few blogs I started to follow two years ago. I learned so much from her, and finally got to say “hello” in person at QuiltCon this past February. Anne : Where did you grow-up? Anne: Where did you go to school, college, post-graduate? And what is your design background? Lee: I got my degree in journalism from Michigan State University (go Green!) I logged in a few years as a reporter/editor/publishing-jack-of- all-trades before realizing that my design-related duties were what I really enjoyed the most. So I taught myself Photoshop and Illustrator and transitioned over to the graphic design side of things, full-time. Anne: Tell us what you want to share about your family now, and how motherhood has affected your quilting and designs. Lee: I live with my husband and two daughters, who are 8 and 6. I guess I would say motherhood is the whole reason I started quilting—when I quit working to stay home with my daughter, I needed a hobby, and quilting was perfect. Anne: When you were growing up did you sew/quilt? Did you have any influences, such as a Grandmother, Aunt, Mother, friends, etc.? If so, how did that grow and evolve. Lee: I did not sew or quilt at all when I was growing up! My mom sewed things like curtains for our house, Halloween costumes, etc., but I had zero interest in it at the time. However, I did have a quilt on my bed while I was growing up that was made by my great- grandmother. I wasn’t a great sleeper when I was a kid, so I remember spending a lot of time lying in bed staring at that quilt, for lack of anything better to do while I wasn’t sleeping. LOL. I remember trying to decide what my favorite prints were in that quilt. So who knows, that may have subconsciously influenced me! Anne: Tell us about your design process. Do you choose to work with certain color palettes? If so, how do you decide which ones you will work with? Would you discuss your style, and some of the fabric collections which are your favorites? Lee: People ask me this question a lot, and it’s so hard to answer! Sometimes I start with a certain color palette (usually something I found online), sometimes I start with certain fabric, and sometimes I start with a design and then plug colors/fabrics into that. I guess it depends on which of those elements is inspiring me at the moment. I love any fabric by Alison Glass, Carolyn Friedlander, Violet Craft, Cotton+Steel, and much more! Anne: Describe your sense of style. If it has changed or evolved over time, please expand upon that. If you can discuss and share your next projects, that would be great. with Faith and Katie was a big turning point for my style. I always loved taking traditional blocks and making them “modern,” but I think coming up with great designs for the book forced me to get more creative with the overall layouts of the quilts than I had been before. And working with Faith and Katie inspired me in a way that I couldn’t have been if I had written the book alone! The three of us are hoping to collaborate on another project in the future, although I don’t know if it will be a book or something else. Anne: What influences you when you design and create quilts and other sewing projects? Physical, written, scenery, spiritual, elements, etc.? Lee: Anything and everything! I’m constantly on the lookout for any kind of geometric repeating pattern. You can find them anywhere if you look! Anne: What design elements are your favorites or signature elements? Are there certain; colors, shapes, prints, fabrics, or embellishments you tend to like and use most? 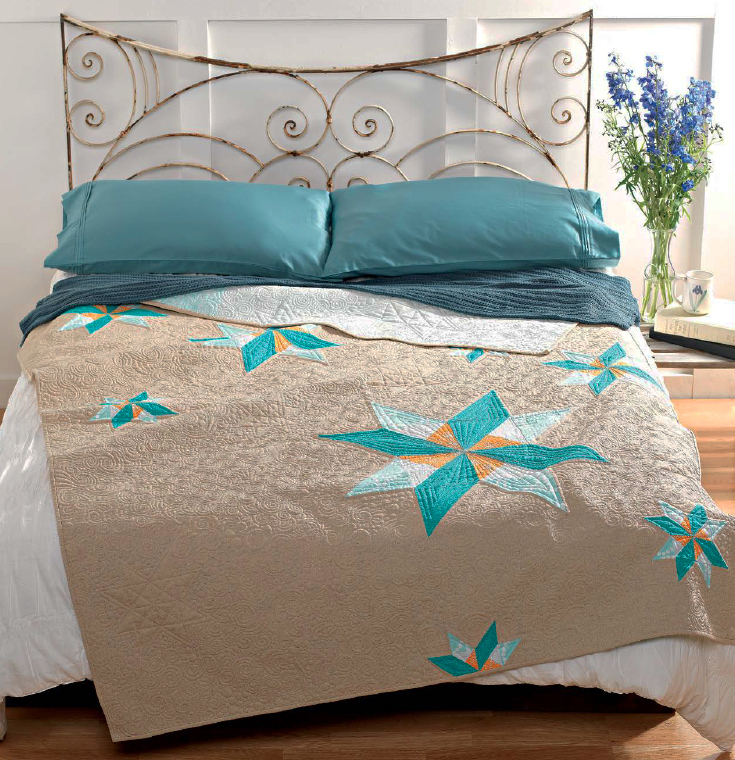 Lee: Well, I’m guessing there aren’t many quilts of mine that don’t have aqua in them somewhere : ) I also loooooove a good color-gradient quilt (my Terrazzo and Sparkler patterns are two examples of that). In fact, recently I had to resist the urge to do yet another color gradient quilt. I don’t want to return to that well too many times. LOL. Anne: Describe a typical day for you at your studio, if there is one. Lee: Like you said, there is no typical day! And with my kids starting summer vacation next week, there will definitely be no typical day for several months! Honestly, just sitting down to sew is often my biggest challenge. It seems like there are so many immediate tasks that are just the day-to-day responsibilities of running a business. Between that and all my mom duties, I have to be very protective of my sewing time. Sometimes it happens, sometimes it doesn’t! Anne: What fabrics are your favorites to work with and why? Lee: I gravitate pretty strongly toward tonal prints and blenders, because I think those have the most graphic impact in a finished quilt. For me it’s all about the overall look of the completed quilt, rather than the individual fabrics! Anne: What artists, architects, designers, etc., (not in our industry), have influenced you? Lee: I can’t really point to any specific influences, but I love design in all its forms and I’m constantly looking at interior design and graphic design websites, so I’m sure what I see makes its way into my quilts in some form or another. Anne: Do you find that it is mostly the more modern/contemporary quilters and sewers purchasing your book, or participating in WIP Wednesdays, or are you crossing that divide into ‘traditional’ fabric buyers and quilters as well? Lee: It was definitely a goal of ours for Vintage Quilt Revival to be appealing to both modern and traditional quilters alike. We believe that both groups can learn a lot from the other! I’ve spoken at many traditional quilt guilds in my area, and I am constantly impressed at how willing most of those ladies are to consider new styles of quilting. I think most people out there just sew what they want and aren’t too concerned with labels. And that’s how it should be. Anne: Is there something you can share with us that you made, that you are most proud of? Please tell us about it. Do you have a photo? Lee: Wow, tough question to pick just one thing! I think my projects for Vintage Quilt Revival, collectively, would have to be what I’m most proud of, simply because I think that was a period of real creativity for me. 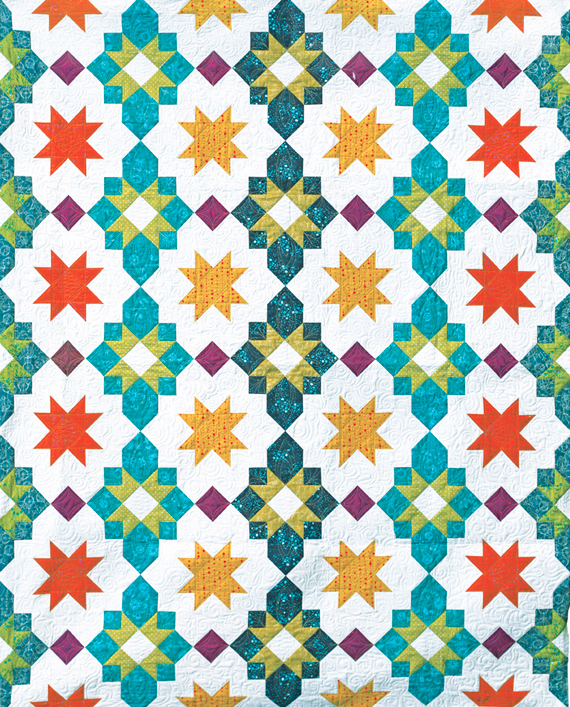 From the top – Spin it Again Quilt, from p. 86 of Vintage Quilt Revival. Middle quilt – Diamond Tread – Click here to see this quilt on Lee’s blog. 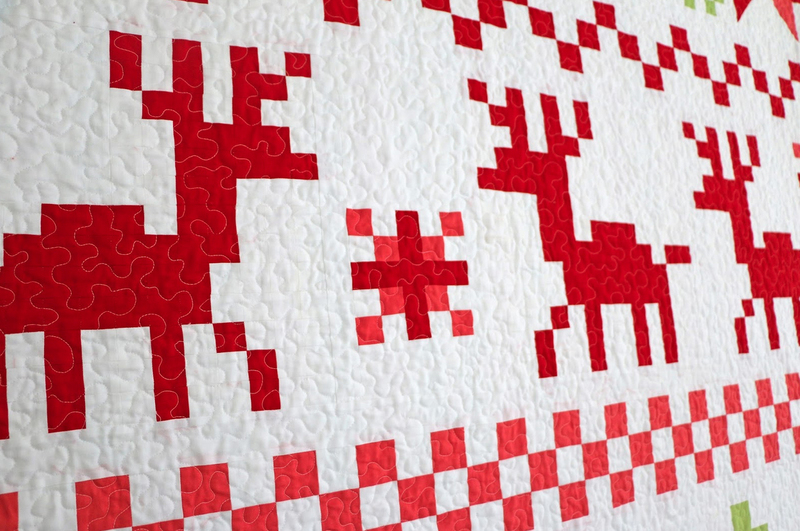 Bottom quilt – Make the Sugar Snow Quilt, from p.66 of Vintage Quilt Revival. Anne: What do you see for the future of Modern Quilting in fabrics, fabric and quilt designs, and “just” the quilting? Are you working on another book? Please share what you can. Lee: I’ve learned a long time ago not to try to predict 🙂 But I think the future of Modern Quilting is exciting, and the industry, to keep bringing exciting new things to quilters. Thank you so much, Lee, for sharing your time with us. Your quilts are so original and fresh, (LOL), but I’ve always thought of them that way, even before the book came out. And thank you for sharing a bit of your life with everyone. It is true generosity of spirit, and that’s what my grandma Lo would say, when people do that with you. And Lee has generously offered a give-a-way today; a free pattern of the winner’s choice. Please leave a comment in my comment box, and tell us which one is your favorite pattern from Lee’s shop. The winner will be announced on Thursday, June 18. Please make sure I have your e-mail address, if you are a no-reply blogger. Please check out the 2015 New Quilt Bloggers Blog Hop. You will discover some wonderful new quilters and new quilt bloggers. I read every post, and reply by directly by e-mail. Happy Quilting!! 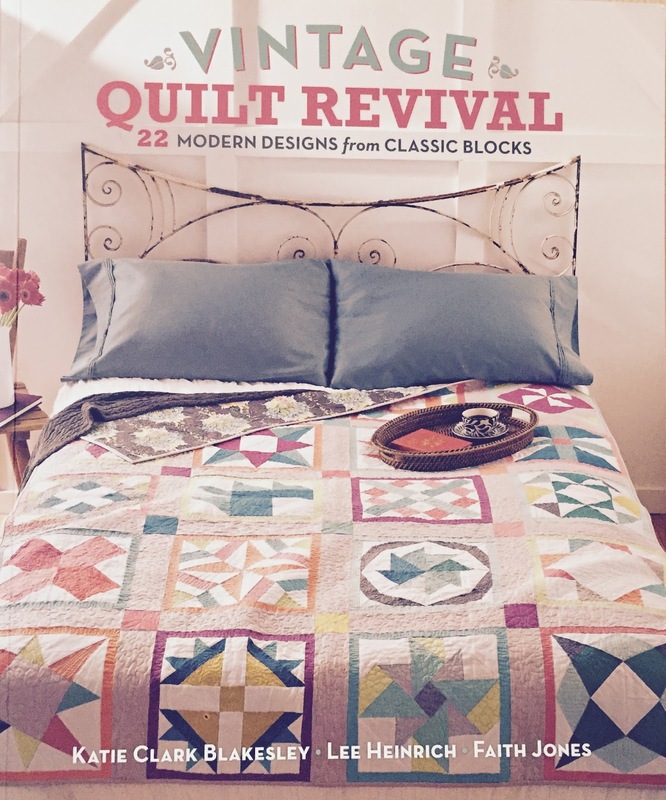 "Vintage Revival Quilts, amazon, Freshly Pieced, Give-a-Way, http://schemas.google.com/blogger/2008/kind#post, Lee Heinrich, modern, QuiltCon, Quilts, WIP Wednesdays at Freshly Pieced. I would love to make the Sparkler pattern. I love Lee's patterns, generally, and I would really like to try out her new Chevron Star pattern. Love Lee's Shooting Star pattern. Thank you. Great interview of one of my favorite designers!! If I must choose only one, I really love her Terrazzo pattern! Lee's patterns are so fun! It's hard to pick just one. Cartwheel looks fun to me. I can see it in rainbow colors too! Fab interview! It's hard to pick one but I really love the new Moroccan Lanterns pattern. Hi there, I love Lee's patterns and have 3 on my 'to buy' list: Gridlock, Sparklers and Wavelength!!! Wow, nice interview. I really love the Moroccan Lanterns pattern. Is that in her book? I really like the Moroccan lanterns, is that in the book? Enjoyed your interview with her. First, congrats on the new grandbaby! Lee has some interesting patterns for sure. I like Chain Reaction! My favourite of Lee's patterns is Terrazzo. I like both rainbows and colour gradient designs, so this is for me the number one, although they are all wonderful. Terrazzo would be colorful and fun! It's hard to pick just one, but I think mine would have to be Sparkler. Thanks for this interesting interview with Lee! What a great interview…thanks for sharing. I think Chain Reaction is my favourite. I love Lee's FAIR ISLE pattern which I have. Second choice is MORROCAN LANTERNS if I were forced to choose! I thoroughly enjoy reading her blog. I loveTerrazos. Actually they are all wonderful. This is difficult to chose only one. LOL Wow, this was great learning about Lee. Thanks for sharing the interview. I love all of the patterns but Moroccan Lanterns is my favorite. Thank you for a chance to win! 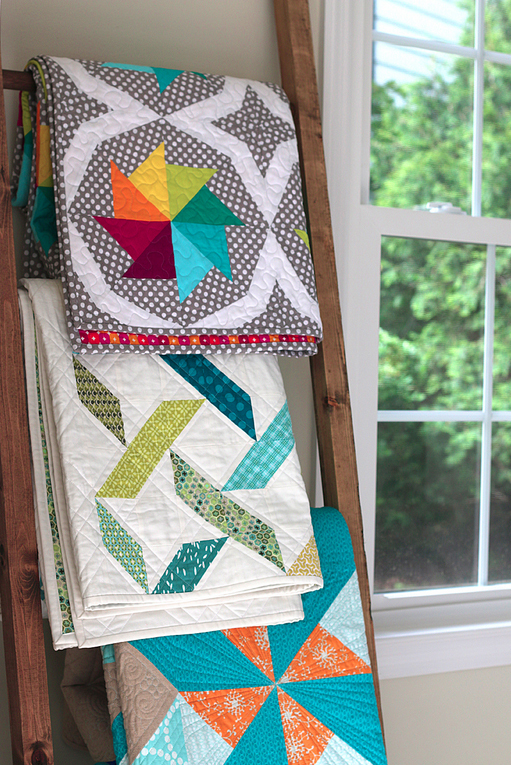 I really enjoy Lee's blog, too, and am in LOVE with the Fair Isle quilt. Spin It Again has always appealed to me. I love the design of geometrical patterning. Enjoyed reading more about Lee in your interview and have always enjoyed her blog. I would love to stitch the Moroccan Lantern pattern. Thanks for the giveaway! Oh too many to choose from but Morrocan Lanterns is my new fave! I have loved the Cathedral Square pattern for a while now, and I actually already have it and am currently working on making it! I would like to try Moroccan Lanterns. Really enjoyed reading your blog. Thank you. My fav is Cartwheels. Thx for the opportunity! A great interview, I have always admired Lee's work, even when I didn't realise it was her! I do like all her patterns, but I think Chevron Star is a favourite. I can't wait to make the Spin it Again quilt. I agree that most quilters just love to make quilts and don't worry about being labeled. Lucky you to be doing an interview with a great quilter and blogger. Thank you for sharing. Congratulations. 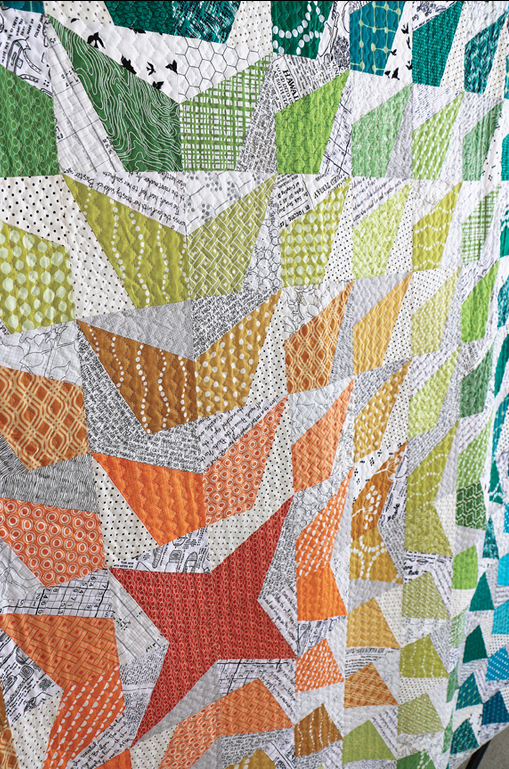 You are the lucky winner of a pattern from Lee Heinrich's shop, blogger of Freshly Pieced. Please send your e-mail address and snail mail address to acbeier71@gmail.com, so we can send you your pattern. Please specify which pattern you would like, and if you prefer digital or paper. Enjoy. Hard choice, but I love Moroccan Lanterns! Moroccan Lanterns is my favorite I think, although I also like the Fair Isle one. I absolutely love the Terrazzo pattern!